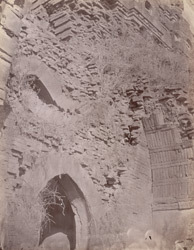 Photograph of arches in the Mahabodhi Temple at Bodh Gaya, from the Archaeological Survey of India Collections, taken by Joseph David Beglar in c. 1870s. The Mahabodi Temple complex is one of the holy sites related to the life of Buddha as it is the place where he attained Enlightenment. The original shrine is believed to have been raised by Emperor Ashoka in the 3rd century BC and the present temple dates from the 7th Century, late Gupta period. The temple was built in front of the Bodhi Tree, under which the Buddha obtained enlightenment, surrounded by a quadrangular stone railing. This is a close view of arches on sides of opening of second storey of the Mahabodhi Temple, before the restoration. Repairs and restoration of the temple were undertaken by J.D. Beglar, an appointment authorised by Sir Ashley Eden, Lieutenant-Governor of Bengal, in 1880.